Proud Parents of a Budding Basketball Star or Gymnast, Your Prosper Home Awaits! Does your life revolve around kids’ basketball games and cheer practice? We’ve got the home for you! And if you have OU in mind for their college destination, you won’t even have to redecorate. Amenities of this backyard of this spacious new listing in Prosper include an outdoor basketball court bedecked in University of Oklahoma’s colors and logo, a permanent tumbling track, a trampoline set in-ground, and a fabulous pool to cool off in after the game or workout is done. 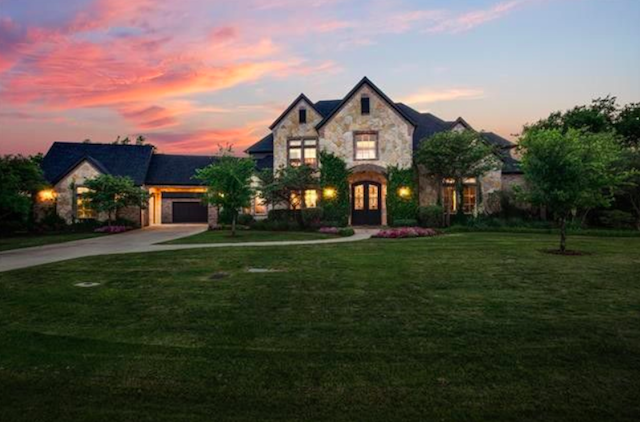 Set on a one-acre lot backing up to private lake, the 5,598-square-foot, two-story, five-bedroom, six-bath home at 951 Woodview Drive is set in the Whispering Farms neighborhood of Prosper. Once the central railroad stop between Dallas and Sherman, Prosper is an affluent suburb located 35 miles north of downtown Dallas and 55 miles from Fort Worth. From this small town, it’s a quick jaunt to Frisco to the west, McKinney to the east. Love dogs and horses? Looking for a place in the country? The 4,400-square foot, two-story, four-bedroom, three-and-one-half-bath Prosper home at was built with canines in mind; it’s well-suited for horse lovers, too. Located at 3730 E. Prosper Trail, the property’s 10.59-acre site makes the term”country estate” apropos. The heavily wooded property is surrounded by a creek and boasts a stocked pond. The traditional-style house has all the amenities you’d expect of a luxury home: an oversized kitchen with a cozy keeping room; a study; a master bedroom and two guest bedrooms downstairs, split for privacy; a large game room and en-suite guest bedroom upstairs; and built-ins throughout, including a dog bathing space in the laundry room. There’s also a 1,000-square foot workshop, a barn, an outdoor kitchen and pool, plus customs dog quarters and a dog run — it’s the perfect set up for family with four-footed kids, perhaps in abundance: room to run, woods and creeks to explore, a pond and a pool for cooling off, a place for grooming and abundant grassy space for training and playing ball.